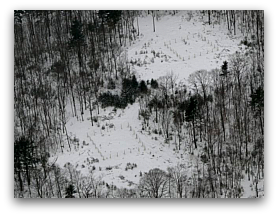 In cooperation with the Massachusetts Department of Conservation and Recreation, Massachusetts Division of Fisheries and Wildlife, Harvard Forest, and several other groups, we have built 16 sets of experimental exclosures to monitor the response of forest vegetation in relation to browsing by moose and deer. Each site has two 20x20 m fenced treatments (full exclosure with fencing to the ground, and a partial exclosure with fencing two feet off the ground to allow access to deer but not moose) and an unfenced control. We have documented varying responses of woody vegetation based on treatment in the first few years of the experiment. Our goal is to see that this experiment continues for at least the next few decades.